PLANS The local Map of 1822 shows a detailed map of the Prison in Salt Lane (now Castle Street) but only five properties on the East side of a developing Britannia Square. The West side has no detail and The North and South sides are detailed in plot numbers only. No. 45 is identified by its shape alone on the NE corner. By 1832 a comparable map shows the outline of a building on plot 45. Over 50 years later the 1888 large scale map indicates a significant extension to No 45 at the North end of the building beyond the ground and first floor bay windows. The Square is by now fully developed. 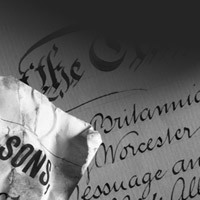 Mr Bevington was a Director of Worcester Paper Box, moving from 18 Albany Terrace. In May 1917 No 45 was “...insured by Royal Exchange Assurance for £1540 at an annual premium of £1 3s 3d"